BRRR! It’s cold in the desert! We are looking to see 19 degree weather the next two days with snow tonight! That being said, I decided to rough it, Canadian style, and light up this La Herencia Cubana Dos Capas Toro. The Good Stuff: La Herencia is an exclusive brand brought to you by cigar.com/cigarsinternational blended by the one and only A.J. Fernandez. A.J. is a master, and has been on a roll kicking out some of the last few years best cigars. The Dos Capas is a limited edition run and sports the same mold as the standard La Herencia Cubana which is composed from an all Nicaraguan mashup of tobacco grown in the Estelí, Condega, and Jalapa regions. 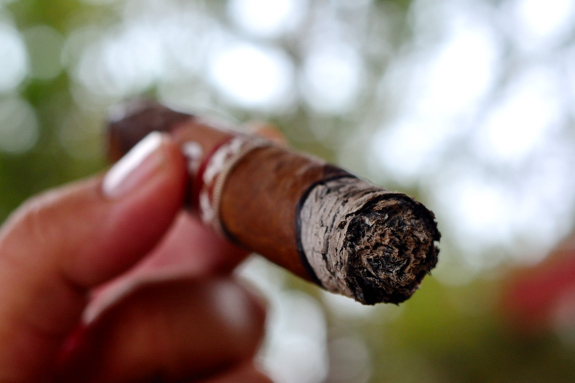 The Cigar is then wrapped in a beautiful Ecuadorian Sumatra (same as the Cubana), only with a twist (pun intended). A.J. decided to have a little bit of fun and barber pole the wrapper with the Ecuadorian Sumatra and a deep, dark, Pennsylvania Broadleaf. These cigars run for $6.50 a cigar. 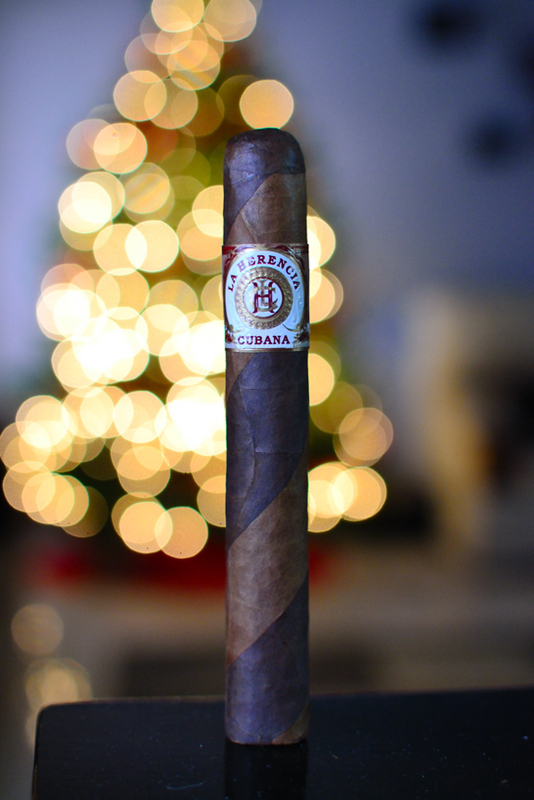 Prelight: The La Herencia Cubana Dos Capas is a thick, rustic looking barber-pole style cigar. 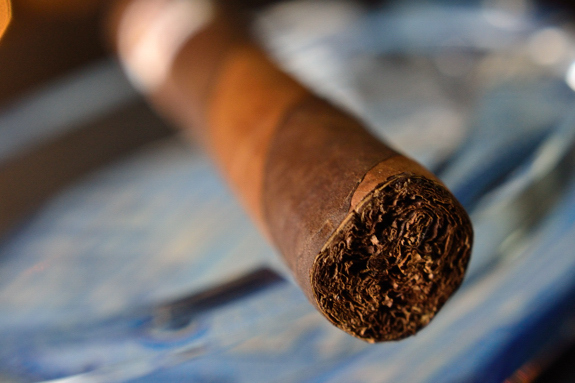 The wrapper is composed of two wrappers, a dark, brown oily maduro, and a medium brown, and orange oily wrapper twisted parallel around the body of thick cigar. 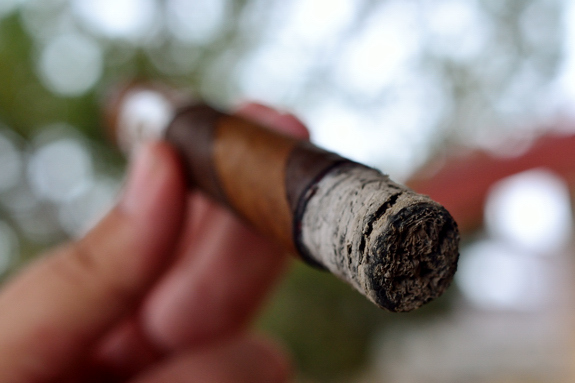 There is only one larger vein running in both the maduro and lighter shade wrapper at around the same area. Despite being a barber pole cigar, its really durable and you can handle it pretty heavily without risking the delicate construction. 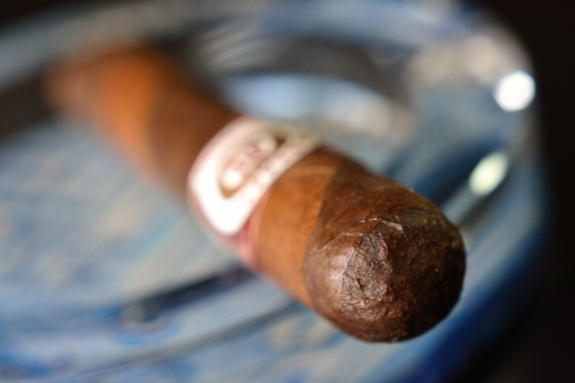 The La Herencia Cubana Dos Capas is finished off with a huge, rounded, maduro double cap. The band is similar to most of the other bands in the La Herencia line. Red, brown, gold and white with a huge crest carrying the name “La Herencia Cubana” on the front, and a smoke red lion in the back. The wrapper of the Dos Capas gives off a great, strong sweet tobacco scent while the foot gives off more of a timid chocolate and earthy aroma. The La Herencia Cubana Dos Capas cut clean and easy using my double bladed Colibri Cutter. The cold draw kicked out some nice chocolate and tobacco flavors along with a really neat earthy grain that I wasn’t really expecting. First Smoke: The La Herencia Cubana Dos Capas starts out with just a ton of bittersweet chocolate, and sweet tobacco flavor. There is a bit underlying spice and pepper, but not a whole lot. This cigar tastes like it was dipped in melted Hershey bar. The Aroma from the stationary smoke compliments the chocolate, and tobaccos tastes perfectly. The draw is perfect, again filling my mouth with just enough thick, white smoke after only two puffs. The burnline is razor sharp and dead even leaving behind a trail of solid white and light grey ash. It will be interesting to see how well the burnline does as I get further into the cigar due to the crazy wrapper this cigar has. The ash held on for about an inch and a half before toppling into my ashtray. Halfway There: The chocolate is still by far the dominant flavor. There is a bit more spice starting to creep its way in as well as a little cedar, and even honey. This is a sweet cigar through and through. The retrohale even produces an excellent chocolate priming with a ton of cedar mixed in there. The burnline is still perfect despite me thinking that the burn would start to go haywire at some point. The cigar is so smooth, and mild that I am feeling absolutely no nicotine even after the second third. Finish: Even though this La Herencia Cubana Dos Capas is giving out some neat favors, it’s starting to lose my attention into the final third. It’s got some awesome flavors, chocolate, cedar, and spice, but nothing that really stands out nor are there any considerable changeups from the second third into the last. It’s a smooth, mild cigar. There is no nicotine kick, and absolutely no harshness into the final inch. 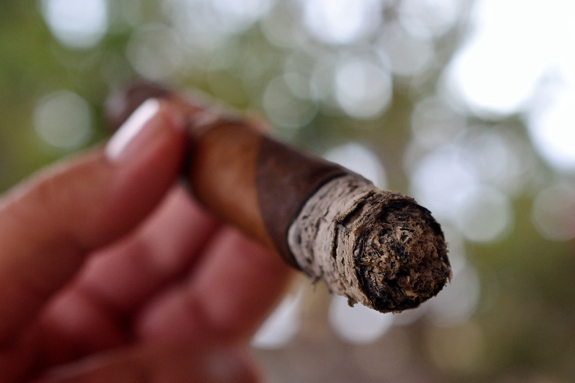 The cigar took about an hour and a half to take down, and burned flawlessly with no touch ups or relights required. 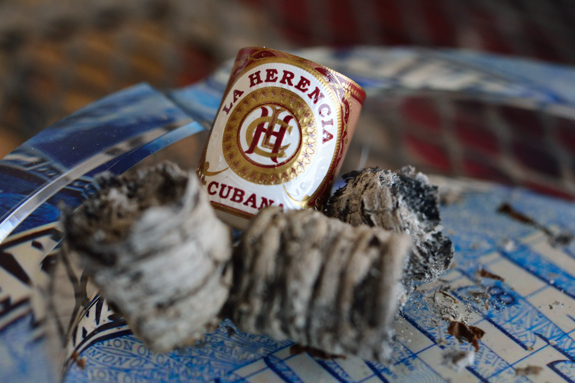 Overview: This La Herencia Cubana Dos Capas is a great cigar. Well balanced, smooth, and sweet. It was just a little too smooth for my liking. This would be an excellent cigar for someone who is just starting out, or even a perfect morning smoke. I’d just stay away from it if you want a more robust, and complex experience. It’s definitely worth having around, but I wouldn’t run out and buy a box or anything. 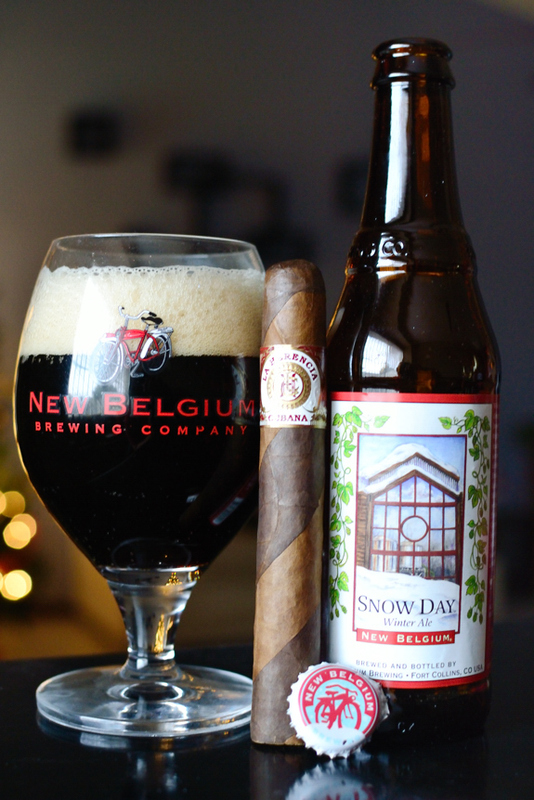 Pairing: Since we are due for some snow in out chilly El Paso desert, I decided to pair this La Herencia Cubana Dos Capas with a New Belgium Snow Day. Snow day is an experimental Winter Warmer style ale brewed at the New Belgium brewery in Fort Collins, Colorado. A year or so ago, the brew masters at New Belgium became snowed into the brewery. They did exactly what any good brew master would do, brew some beer! They created an experiment. Basically they hopped the hell out of a winter warmer ale and created an interesting Pale Ale style winter brew. That’s right. Interesting enough the beer comes in at 6.2% ABV and carries a very hoppy taste similar to most pale ales, but threw in some awesome spice, cinnamon, malt, and orange to give it this special winter twang. It made for a great pairing, but the entire time I smoked the cigar I kept telling myself “Man, this thing would go perfect with some black coffee”. Try it for yourself. Once again, great review & great shots. I love the ones w/ the x-mas tree backgrounds. Nice job. Great review! Atta tap into your Canadian side! Sounds like barber pole wrapper performed well…do you think it really added to the overall experience of the cigar and created a unique experience or just a marketing thing? Do you see more manufacturers trying this out? Honestly, I don’t think it added much. It did bring in some extra sweetness from the maduro, but this same effect could have been achieved by tweeking the wrapper binder a bit. I think it has a lot of marketing built into it, but thats not a bad thing. They are excellent looking cigars and fun for really anyone to have in their humidors. This one sounds a lot better than the Oscuro Fuerte that I tried. I may have to pick up a few for a change of pace in the morning. Exactly! Not your normal Winter Warmer. I’m not a hoppy buy, but I enjoyed it. Not as much as a nice Porter or Stout, what I normally drink in the winter, but it was an interesting interpetation of your standard winter ale. I have been a long running fan of AJ. Have you had the Emilio AF1/AF2? Those are DAMN good! Sounds/looks like this stick is a winter winner. Just gotta say that throughout the review and looking at the pictures you took of this cigar. One word kept cycling through my head, “juicy”…weird. HAHA! You know what, it does look kinda juicy.